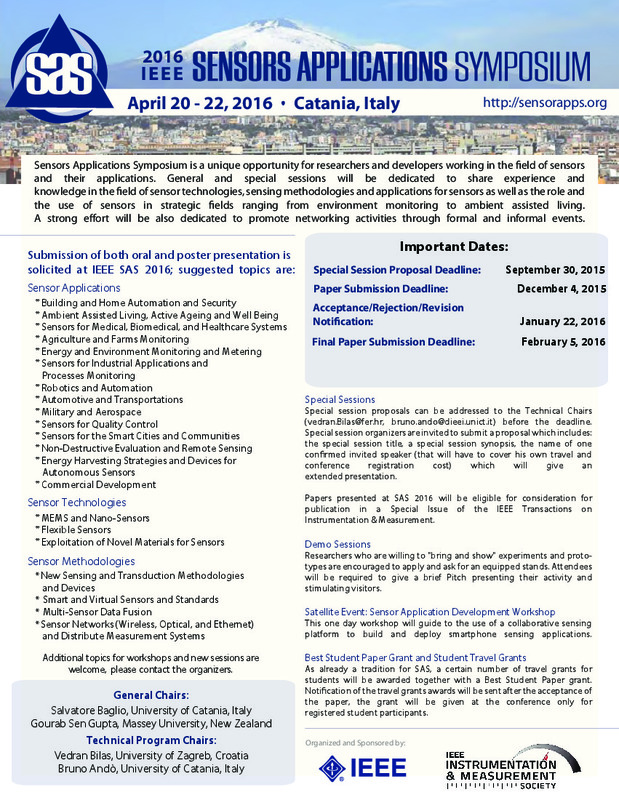 2016 IEEE Sensors Application Symposium has received more than 130 papers submitted and the event is going to respect its tradition by gathering together a large number of researchers involved in the the fields of Sensors and Sensor Applications. We invite to submit your Extended Abstract of maximum three pages. Each paper must be within the scope and topics of SAS 2016, follow the same formatting guidelines provided on the SAS 2016 website, explain the significance of the technologies/methods/applications in the paper, and contain a list of key references. Visit the author instructions page for more information. SAS 2016 is pleased to offer student travel grants. Student Travel Grant winners will be notified shortly after the January 22 notification date.